Our menu lists the most popular Mediterranean catering favorites and if you want something you don't see on our menu, just tell us what you need and we'll make it happen. A full-size delivery order serves about 20 guests and a half-size order serves about 10. 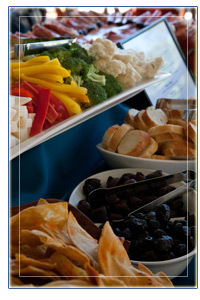 Accurate serving numbers will depend on how many various types of menu items you choose for your event. Our expertise in event planning will help you decide the ample quantity you will need. 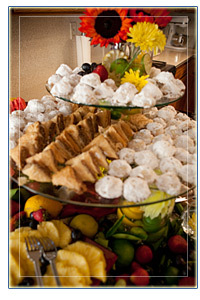 Sifnos Catering is a full service catering company. We can work with you to plan your menu and the services you need for any type of event and budget. We aim to please and we want to make it as easy as possible for you. We will work with you every step of the way for all your event needs- always in constant communication, from custom menus and service to accomodating your specific needs. We want to make this a happy memorable experience you will always remember. A 25% deposit is required when placing an order for a larger event. The balance is due on your event date. We take credit cards, checks or cash. Service and delivery charge applicable. A 50% fee will be charged if cancellation occurs within 5 days of a formal event. Smaller delivery orders require 48 hour cancellation time. An 18% service charge will apply. Sifnos Catering is fully insured and can provide additonal insurance certificates needed for any public or private venue. We hold appropriate insurance for beverage and full bar-service.